This thread regroups Rikiki's MiningCo. mods: designed to fit to the best with vanilla ambiance. Those mods add some content from a fictive famous mining company: Mining & Co. Please see this thread for my other miscellaneous mods. MiningCo. Mining helmet: adds a mining helmet to help you mining more efficiently and not fear the dark galleries anymore! MiningCo. 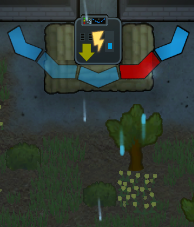 Alert speaker: adds an alert speaker which prevents you from danger and provides your colonists some adrenaline bonus. MiningCo. Laser fence: adds an advanced laser fence to get rid of those pesky critters roaming your potato farm! MiningCo. Force field: ideal to protect yourself from a rain of tribal arrows or pirate bullets. MiningCo. 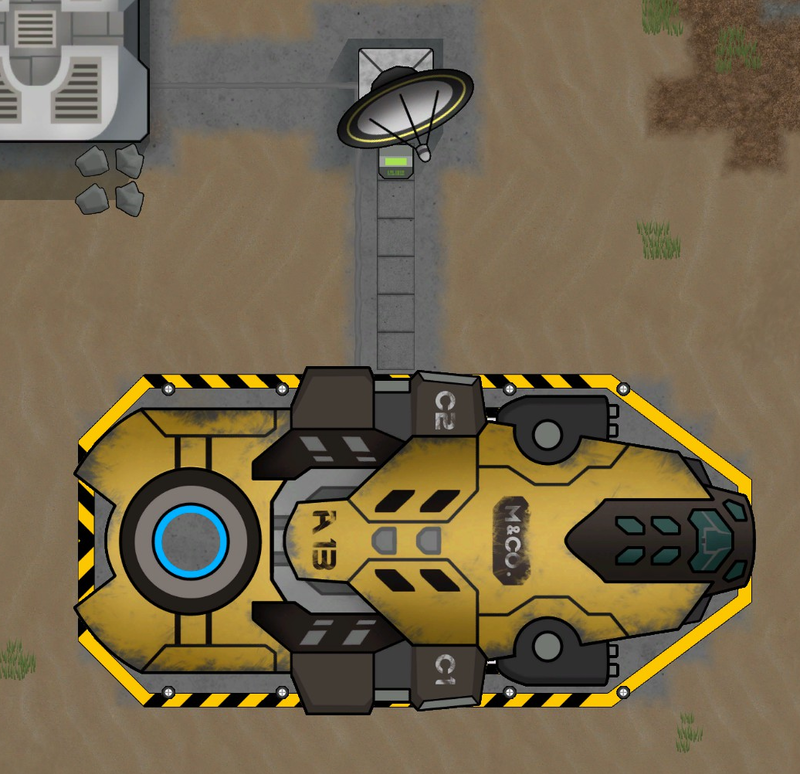 Outpost generator A13: adds a pseudo-random outpost generator. MiningCo. Power fist: utility weapon able to repel enemies and stun them. Deals additional damage to mechanoids. MiningCo. Spotlight turret: utility turret used to spot and light hostiles in its perimeter. Very useful during dark nights. MiningCo. Drill turret: utility turret used to automatically drill nearby ores and designated rocks. MiningCo. Spaceship: adds cargo, medical and dispatcher spaceship and air support (for a price)! Surface resources are becoming scarce ? Wandering the plains is too dangerous for you ? Then MiningCo. has THE solution for YOU! MiningCo. is proud to present you the Mobile mineral sonar Mark III, one of the jewel of our mining systems collection. Thanks to our revolutionary MiSoTechTM, jointly designed and tested by our highly experienced teams of engineers and deep-space miners, the Mobile mineral sonar Mark III is an essential asset for every miner. Scans the heart of big mountains for metallic objects. Can be easily displaced when the scan is finished (minifiable). Battery-powered: the optional connection with a power net will boost scan speed. "Now that I've got the taste of it, I cannot do without my pretty DeepLily. To me, she's more precious than my b*lls! Hey, you! Get your hands off, you're going to scratch her body! ", Todd the Tough, deep-space miner. MiningCo. is continuously trying to improve its product to raise its customers satisfaction. * Corrected inspect string error on minified MMS. * Corrected range when placing blueprint. * Added a small flash to help locate the MMS in the wild or inside deep mountains. * MMS can now be moved as any other furniture. * Re-activated code so thingDef to scan can be added in MMS XML def. * Minerals have now a better chance to be detected the closer they are from the MMS. * [s]Scanned things can now be added in MMS XML def! [/s] => disabled for now. Will be re-added in next version. * Scanned things can now be added in MMS XML def! * Slow down scan progress when not powered. Increased power need (1000 -> 3000). * Detection threshold takes into account distance from the MMS. * Re-added plasteel detection thanks to Delmain ;-). * Greatly simplified research and construction thanks to new components (no more energy pack and mineral sonar). * No more detect plasteel (detect compacted components instead). * MMS is now a minifiable thing (easier to deploy elsewhere). * Simplified the energy pack requirement (it is no more needed to resupply when displacing). * MMS now detect uranium as well. * Greatly simplified the techtree to fasten access to the Mobile mineral sonar. Any miner has a solid helmet. But only MiningCo. miners have helmets with a light! This mod just adds a mining helmet whith a light... which actually lights the area! (Preview image is not up-to-date). 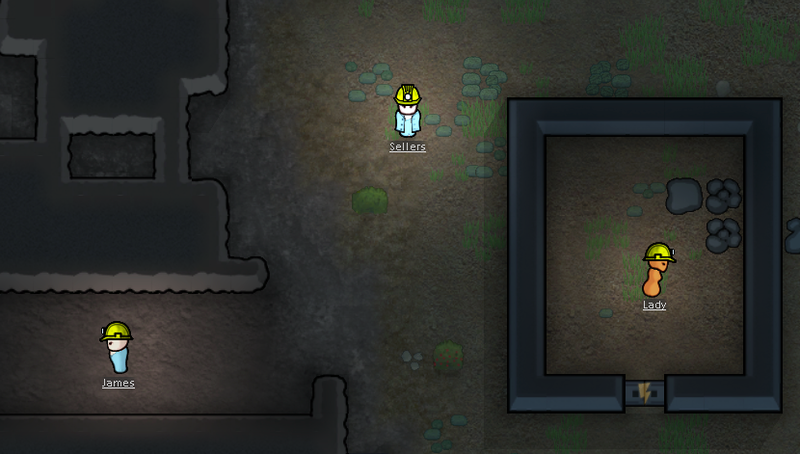 Adds a mining helmet which light is turned on when a colonist is in a natural cave or mining. The mining helmet also provide a small bonus to mining operations and some defense against blunt (falling rocks, tribal mace, ... ) and sharp damages. Original mining helmet texture from the nice Labourer Apparel mod. Code enhancements thanks to Haktrum propositions. * Reworked light logic a bit. * Added buttons to control the light mode (auto/on/off). * Small code robustness improvements. * Some code simplifications due to the new GlowerComp interface. * Light on/off is smarter. * Simplified the code thanks to Haktrum propositions. This should improve performance for people having issues with "dynamic glowers". * Now that equipement can also be ticked while worn, the Map_Component has been removed. This should greatly improve performance. Tick function on worn or dropped apparel. Dear customers, some of you recently reported a bounce of pirate activity in the rim sector. Mining & Co. is always trying to get its customers happy and "A dead customer is a bad customer!". With our new alarm system, the alert speaker, you will never get cought sleeping in your bed during a pirate raid! (a light system is also provided for deaf people). Colonists passing nearby will receive a small bonus to consciousness. * Changed .wav to .ogg sounds (otherwise, it is only played once). * Corrected red light rotation. * Moved researches into a new tab. * Complete rework: no more dynamic glowers for performance improvements! * USe of hediff instead of apparel. * Reduced bonus to only +3/6% consciousness. * No more malus for simplicity. * Integrated JabbaMonkey nice textures. * Splitted M&Co. Security enforcement into M&Co. AlertSpeaker and M&Co. Weapons for easier maintainability. * Alert speaker updated to Alpha 8. * Improved graphics and add of custom motes. Mood and apparel (bonus/malus stat) management. MiningCo. always brings you the best of the technology. 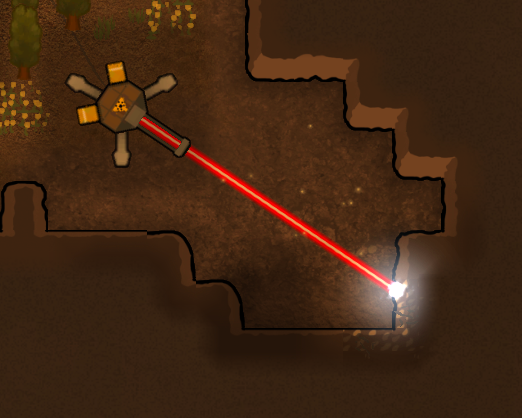 Today, we are proud to present you the laser fence! This will help you to get rid of those pesky critters roaming your potato farm! Starting a new colony is not necessary. 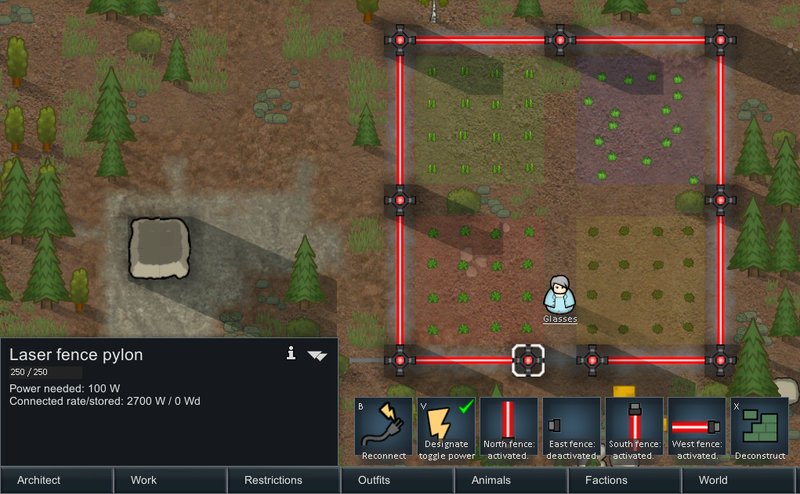 Adds an advanced impassable laser fence for futuristic and cool-looking bases! - A pylon will automatically connect to nearby pylons in each cardinal direction. - Each fence can be independantly activated or deactivated. 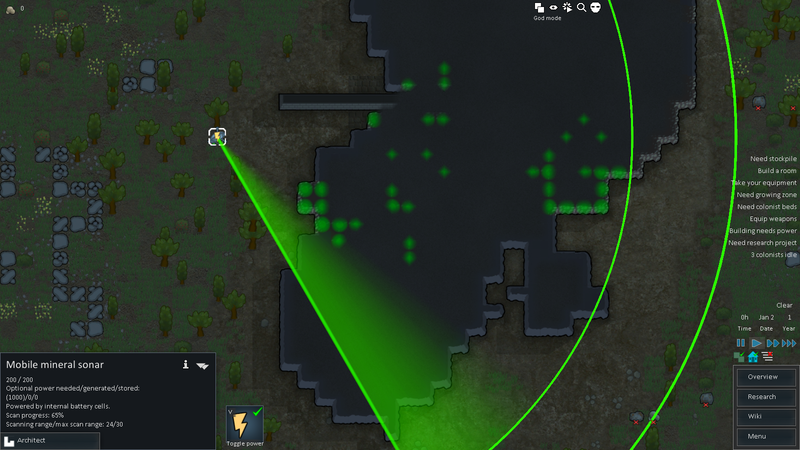 - Max range of a laser fence: 4 cells. * Pylons can now be minified. * Small correction to avoid a potential null reference exception. * Small correction to avoid putting on fire an ally of the pylon during connection. * Added an interraction cell to avoid the case where the player enables fence but the activating pawn is in front of the activated direction. Yeah, that's a lot of 'enable' and 'activation' ;-p.
* Alpha 12 initial release. * Correction of a small connection bug. Local tribes are sometimes not really "cooperative" when an excavation outpost is established in "their" territory. Force field generators are perfect to protect your security forces under a rain of arrows and pila. The force field generator is able to charge up and sustain a protective field which will absorb incoming projectiles. Blocks incoming bullets and rockets. The heavier the caliber, the more power will be drained. Is able to repel incoming low-velocity explosives (grenades). Watch out you crazy grenadier! When powered down, the generator will send back some of its energy to the power net. * Corrects a missing texture error. * Increased the force field cost. * Removed useless gizmo. Flicking the force field gives the same result. * Slightly modified the field drawing (no more dynamic sinusoïdal effect). * Improved the energy management when initializing and during discharge. * Initial release for Alpha 8. No link with jaxxa shield. This mod has been coded from scratch. As everyone knows, M&Co. is the leader of all mineral operations. To ensure a good flow of new mineral veins, the company often dispatches recon teams on rimworlds. This mod adds a pseudo-random outpost generator! Creating a new world is necessary. Adds a genstep that can generate a pseudo-random M&Co. 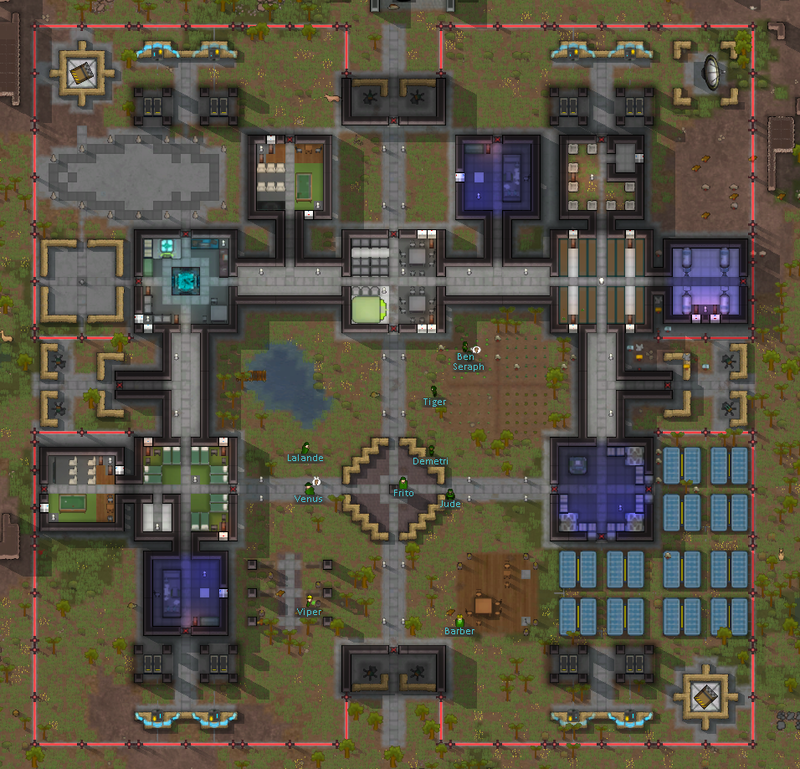 outpost when starting a new colony! There are 2 types of outpost: small and big. 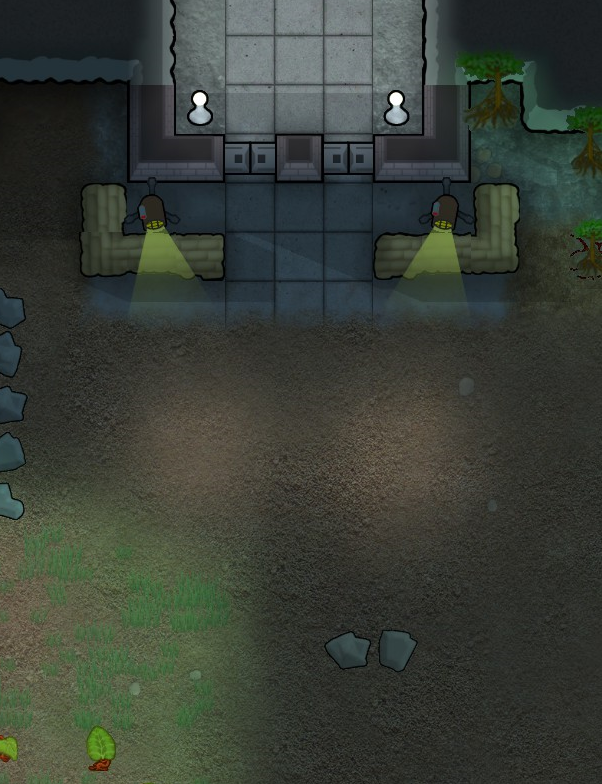 Outposts can be inhabited by autonomous pawns that will defend themselves. Outpost is resupplied/reinforced when necessary by supply ships. This mod uses the content of other great mods (like Haplo's Miscellaneous). I strongly recommend to activate my other M&Co. and miscellaneous mods for a better experience (force field, fish industry, mining helmet and laser fence). This mod adds a genstep and is incompatible with any other one modifying the map generation! Haplo's ruins generator => coming soon! EdB's Prepare carefully => coming soon! Both of them => coming soon! M&Co. is continuously trying to improve its product to raise its customers satisfaction. * Added big outpost generation. * Added autonomous inhabitants controlled by IA. * So many improvements and additions I cannot list them all! * Alpha 12d initial release. * Added a small robustness check in trigger intrusion. Proper compact autonomous generator texture. Other fun things that will come in time. Haplo's/mrofa for the beautiful tactical computer. A Friend/Shinzy for the superb supply ship texture! Joinable Lord (like the party). A good MiningCo. miner never goes to work without his power fist. Useful to handle heavy drilling tools, it is often customized into a deadly weapon by skilled crafters during crisis. Adds a melee weapon: the power fist. - gives a small mining speed bonus. - power fist repels enemies (according to their body size). - enemies hitting an obstacle during repel will receive additional damage. 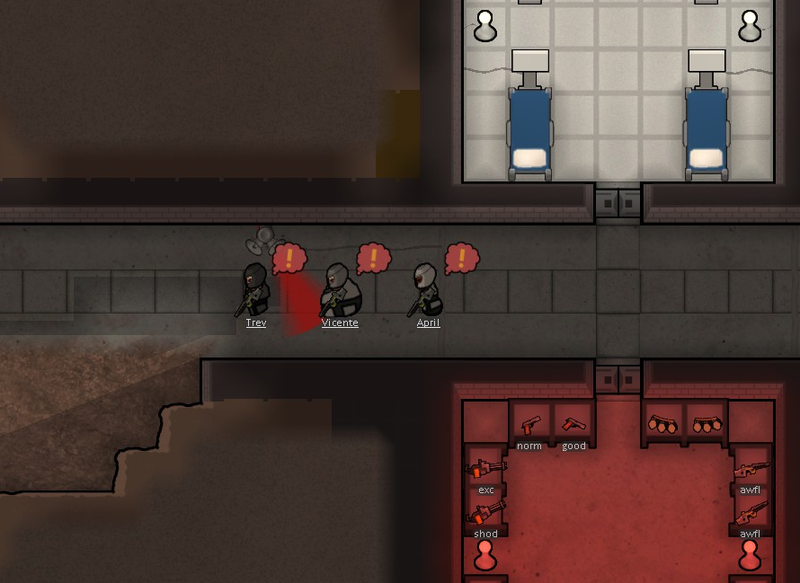 - if pawn is wearing a power armor, mechanoids will suffer from additional electric damage. * Corrected assembly wrong reference. * Added a research requirement to craft the power fist at the machining table. MiningCo. bases security is always a top priority. Projectors are one of the key elements to ensure a safe perimeter. - patrols the area around it according to the selected mode. - locks on hostiles to enhance accuracy of MiningCo. security forces. - blinds targeted hostile if it is facing the spotlight turret (light sight and moving penalties). - you can synchronize spotlight turrets in group for better visual effects. - can be used under roofs. - same as the turret but can target hostiles over walls. - cannot be used under roofs. 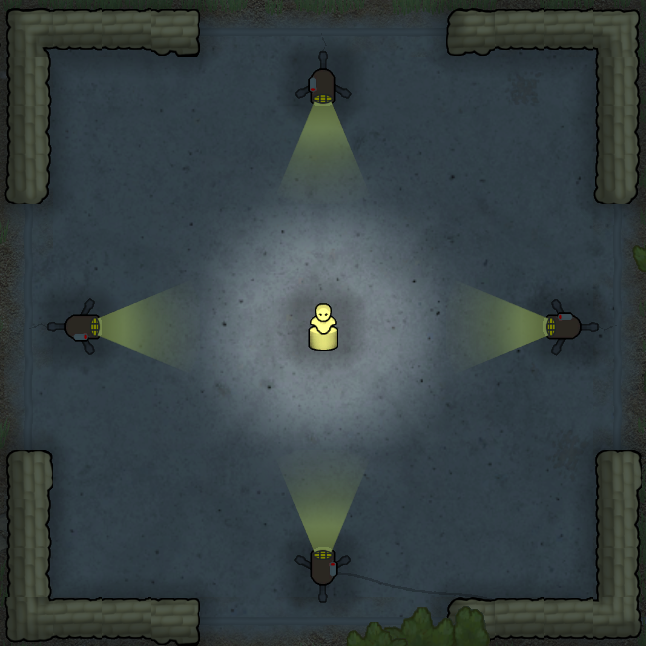 Projector: a simple projector to light your straight military alleys or barbed wired fences. * Turrets can now be synchronized for cool visual effects! * Targeted hostile is blinded if facing the spotlight turret. * Corrected research to unlock the spotlight turret. Draw of dynamic transparent textures. MiningCo. expeditions often carry one jewel of technology: the drill turret. This device can automatically drill nearby ores and natural rocks. Adds a new turret: the drill turret. - automatically drill nearby ores and natural rocks. - mining mode can be switched (only ores, only rocks and both). * manned by a miner (level 20 miner using drill turret mines 2x faster). - drill efficiency and yield resources can be improved via one additional research. * Improved beam effects (proportional to the efficiency). * Turret rotation is now instantaneous (code simplification). * Buffed turret rotation rate when powered. * Added an alert when a turret is idle. * Turret can be manned to improve efficiency. * Efficiency is now displayed when selecting turret. 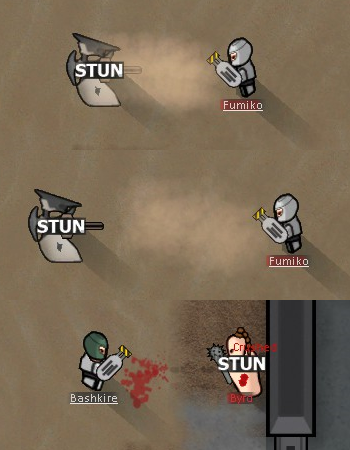 * Increased turret range (10 -> 15). !!! You need to start a new world/colony as this mod adds a new hidden faction. !!! This time, MiningCo. is showing all its might! The orbital station is fully functional, dispatching expedition teams all around this rimworld and crushing any resistance with a rain of bullets, rockets and fire! Want to trade with us? Build an orbital relay and a proper landing pad. Let's the business begin and the cash flow! Having problems with raiders? Request a real air strike! Your pawns are dying from the plague and you have run out of medicine? Request a medical assistance! [li]Your need more and more steel? Request a real cargo spaceship with plenty of supplies! - cargo spaceship: will periodically land to trade few bulk goods. - cargo spaceship: (requested) will land with an assortment of MiningCo. stuff and more bulk goods. - medical spaceship: (requested for a price) will dispatch medics to heal your pawns. - dispatcher spaceships: will pay you to use your landing pads to drop and pick expedition teams. Request air strikes to crush intruders! Warning! MiningCo. cannot be held responsible for any collateral damage. * Corrected pawn generation error thanks to Mehni. * Added robustness for "null pointer in reachable down pawn" bug. * Corrected issues in orbital healing (missing part and max duration). * Added mod setting to disable landing pad beacon lights. * Corrected the "damaged spaceship" reward bug. * Simplified partnership research prerequisites (removed CommsConsole building requirement). * Vulcan turret is no more claimable/deconstructible. A Friend/Shinzy for the superb cargo ship texture! Mehni for his help debugging the pawn generation incompatibility. LordJob, LordToil, Duties, JobDriver, JobGiver, JobEveryThing! work with alpha 11 in first version ? As the API has changed between A11a and A11b, I doubt so. Your best bet is just to test it! BTW, why stay in A11a? Updated Alert speaker and Mining helmet. Enjoy! Finally! The light is back! Keep getting a message that the file is unavailable from the download location with the mining helmet. Good to see this mod updated again. I missed it! Missing the helmet though.... I need my light in the darkness! It matters not if we win or fail. It's that we stood and faced it.